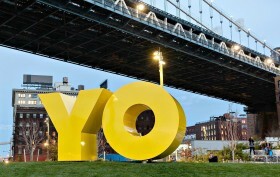 Photo via Etienne Frossard, © Deborah Kass, courtesy Two Trees Management Co.
Be the first to take a pic of the giant new “YO” (or is it OY?) sculpture in Brooklyn Bridge Park which was installed this week. Take in an artist talk with Awol Erizku, who challenges the traditional idea of the male gaze, Fiona Banner as she talks language with the Public Art Fund, or head to the Fashion Institute of Technology for a panel discussion on art in the age of surveillance. Fernando Do Campo unveils a new site-specific installation in Chelsea, Kim Keever’s abstract underwater pigment swirls enliven Waterhouse and Dodd, and Paul Booth revamps his goth gallery, reopening this week. After it’s all said and done, chow down on hot dogs and beer at Paul Pretzer’s studio while getting a sneak peak of his January solo show.